Various factors affect your skin including diet, genetics, and lifestyle choices, such as smoking. Hormones also affect the skin. Estrogen particularly plays a role in the thickness, moisture, and elasticity of the skin. Estrogen levels can change throughout a woman’s life, especially during perimenopause and menopause when levels drop. 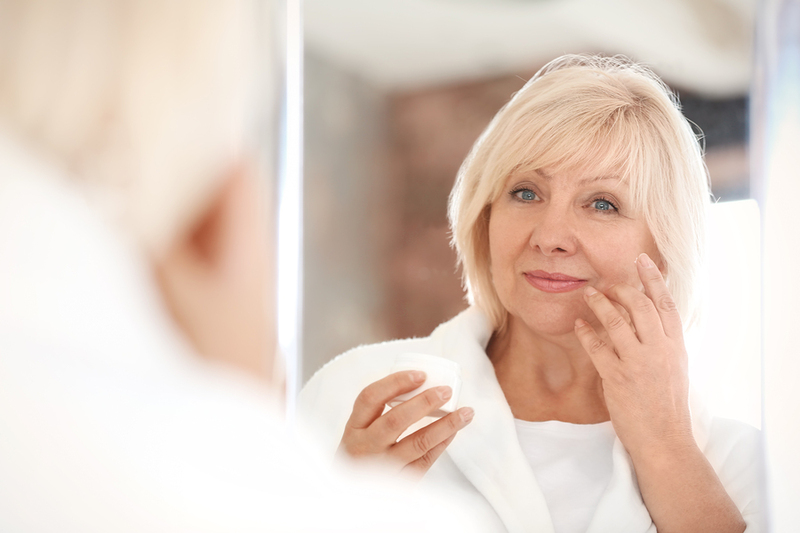 As estrogen levels decline, it’s common for noticeable changes to the skin to develop. The three main hormones that change during menopause are estrogen, progesterone, and testosterone. All three hormones have an essential function in a woman’s menstrual cycle. As menopause approaches, hormone levels change. They may become unpredictable and fluctuate from month to month during perimenopause. Once menopause has occurred, significant hormonal changes occur. Before menopause, estrogen was produced mostly in the ovaries. At menopause, estrogen production by the ovaries decreases dramatically. After menopause occurs, a small amount of estrogen is still produced in the fat tissue. But the overall estrogen level in the body is very low. Testosterone levels also decline as a woman gets older. When you think of testosterone, you might think it’s only a male hormone. But women also produce testosterone in much smaller amounts than men. In a woman’s 20s, her testosterone level peaks and gradually declines. By the time a woman reaches menopause, testosterone levels are about half of what they were in her 20s. Small amounts of testosterone are still made by the ovaries and the adrenal gland even after menopause. Since estrogen plays such a big role in the health of the skin, it makes sense that declining levels are going to have a significant effect. Think about what makes the skin look youthful and healthy. Usually, there are three characteristics of youthful skin including texture, moisture, and plumpness. Healthy looking skin is plump, firm and retains its moisture. Unfortunately, all three of these characteristics are affected by declining estrogen levels. Does a Decline in Progesterone and Testosterone Also Affect the Skin? The main hormone that affects the skin is estrogen. But it is not the only hormone that may have an effect. To a lesser extent, progesterone and testosterone also play a role in the health and appearance of the skin. When estrogen levels decline, hormone levels become imbalanced. The imbalance can also lead to some skin changes. A change in progesterone can increase skin dryness, which can leave the skin on your hands and feet cracking. Testosterone is still produced at low levels after menopause. But too much testosterone can stimulate the oil glands and lead to breakouts. Yes, you can even get pimples in menopause. A decrease in estrogen sounds like bad news for your skin. The good news is there is something you can do about low hormone levels. A natural approach involves restoring hormonal balance during menopause with bioidentical estrogen, progesterone, and testosterone. Restoring declining hormones and maintaining proper balance with bioidentical estrogen, progesterone, and testosterone provides a natural solution. Bioidentical hormones can improve many menopausal symptoms including the negative effects on the skin. Bioidentical hormones are identical to the hormones produced by your body. Every woman’s hormone levels are different. That’s why bioidentical hormones are tailored to each individual woman. It’s not a one-size-fits-all dose. With bioidentical hormones, the lowest dose is adjusted until your menopausal symptoms are resolved. When estrogen and progestogen levels are improved, it can improve the thickness of the skin and maintain collagen production. Increasing estrogen levels may also improve the production of hyaluronic acid, which helps retain the moisture in the skin. The correct balance of hormones allows the skin to remain hydrated, plump and may also slow the formation of wrinkles. Are you experiencing symptoms and wondering if your hormone levels are not quite right? Take our symptom checker to find out what could be the underlying cause of your symptoms, so that you can get to the root cause. It’s time to get your life back! Where do i find Bioidentical homones? If we may be of service to you, please call our Wellness Consultants for a complimentary wellness consultation at 281-698-8698. They will be happy to help you!